Because the relationship between U.S. investment and U.S. savings is determined externally, by the country’s role in absorbing excess global savings, tariffs and other beggar-thy-neighbor policies will not reduce U.S. trade deficits. Most economists limit their discussions about the impact of tariffs and trade intervention to the impact on consumers. This is dishonest, or at best confused, because the primary impact of tariffs (and of trade intervention, generally) is not necessarily on consumption. Countries have successfully intervened in trade for centuries; yet mainstream economists often argue, against the evidence, that trade intervention is always harmful to the intervening country because it raises consumption prices. Trade intervention can also affect households directly or indirectly by slowing the growth in debt, whether consumer, government, or corporate debt. In reverse, this was shown by peripheral Europe before the 2008­–2009 financial crisis, and has been shown by the United States over the past several decades; in both cases, these countries’ need to absorb trade intervention among their trading partners required rapid growth in debt. I have explained how this works many times before (here and here, for example). The basic argument in the case of the United States is that, because of its role as the absorber of excess global savings, the country has run a permanent capital account surplus since the 1970s, which is also why it has run a permanent current account deficit since then. By definition, a capital account surplus—or its obverse, a current account deficit—means that a country’s investment must exceed savings, so that net foreign capital inflows must either increase investment or reduce savings. One hundred and fifty years ago, when U.S. investment was constrained by insufficient domestic savings, it would have increased investment, whereas today investment in advanced economies is not at all constrained by insufficient savings, so it must force down U.S. savings. There are many ways it does so, but these can be summarized as consisting basically of either a rise in unemployment or a rise in debt. For obvious reasons, the United States has almost always chosen the latter. Limiting the discussion of the impact of U.S. tariffs on U.S. consumers is usually the result of either a very poor understanding of trade or a tendency to treat trade ideologically. I have often argued that U.S. President Donald Trump’s proposed tariffs on Chinese and other foreign goods will not reduce U.S. trade imbalances and are unlikely to be positive for the U.S. economy. But to oppose these tariffs on the grounds that they will raise the cost of consumption is silly. That is not why they will prove ineffective. In fact, it is precisely because tariffs will have so small a net impact on the cost of consumption that they will not benefit the U.S. economy. If tariffs could successfully reduce the U.S. trade deficit, only then would they raise consumer costs. But in that case, even with higher consumer prices, American households would overall still be better off because they would more than make up for higher consumer prices with lower unemployment, higher wages, less income inequality, and/or less debt. Industrial strategy: This approach is a more general version of the infant industry strategy and has been employed by governments—like the United States in the nineteenth century and China today—that want to shift a country’s economic structure in one direction or another, usually in the direction of manufacturing, high-tech sectors, or transportation. Industrial strategy often involves policies very similar to infant industry strategies and, to the extent that investment is funded domestically, it can involve policies that boost domestic savings, which I discuss below. For these reasons, industrial strategy tends to have a significant impact on generating trade imbalances, usually in the form of surpluses; that said, when industrial strategy is funded in part by foreign capital, as it was in the United States in the nineteenth century, it results in trade deficits. Boosting domestic savings: Countries that want to raise domestic savings, or that follow what I elsewhere have called a high-savings growth strategy, have implemented policies that force up savings rates in ways that inevitably generate trade surpluses. There are many policies that force up domestic savings, but they basically all work the same way: they transfer income from ordinary households, which consume most of their income, to sectors of the economy that consume little or none of their income. I discuss these policies more later in the blog post. 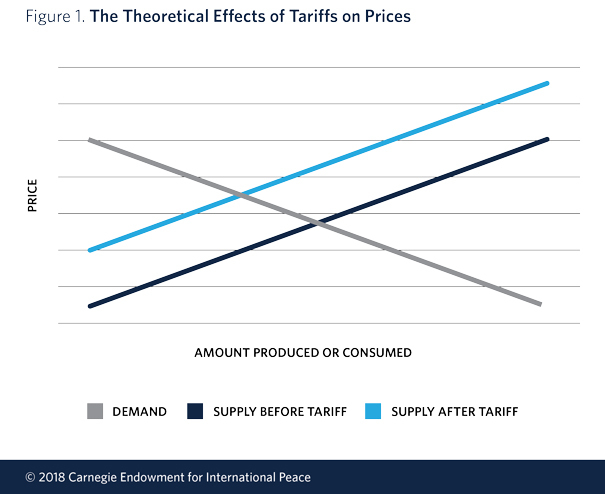 Tariffs can have a significant impact on the bilateral trade imbalance between two affected countries if they cause a reduction in imports from one of them. For example, if China is the main producer of widgets, and a 10 percent tariff on Chinese widgets causes the price of widgets in the United States to rise enough to prompt Americans to cut back sharply on widget consumption, then there would be a reduction in overall U.S. imports from China. A tariff can also reduce the bilateral trade imbalance if it causes a shift in imports. A 10 percent tariff on Chinese widgets, for instance, might cause Chinese widget sales to collapse, to be replaced by a surge in Korean widget sales. If either of these two cases were to occur, Washington would almost certainly declare that its tariff policy was successful because it caused a significant improvement in the U.S. trade deficit, and the policy’s proponents would point to the lower U.S. trade deficit with China as proof. But these two ways of reducing the U.S. deficit with China are not the same. In the first case, total U.S. imports would decline in line with the decline in U.S. imports from China, and the overall U.S. trade deficit would decline as well. In the second case, total U.S. imports were unaffected because the lower imports from China were matched by higher imports from Korea. In this case, there would simply be a shift in the structure of the U.S. trade deficit, but no change in the deficit itself. Günther Oettinger, the EU’s budget commissioner, argued that the real reason for the EU’s persistent trade surplus with the US lay simply with US consumers and their appetite for European products. “The fact that Porsche, Audi, BMW and Mercedes-Benz, that those premium cars are selling like crazy in the US . . . has to do with design and motors, with quality. In contrast there is no real reason to bring an American car from the US to Germany. Once it becomes clear that households are not the only, or even the main, source of a country’s savings, it is easy to see what determines a country’s overall savings rate. The greater the share of income that goes to ordinary households, the greater the consumption share is, and because all income that isn’t consumed is, by definition, saved, the lower the savings share is. Countries with large trade surpluses, driven by their high savings, are mainly countries in which ordinary households receive a lower share of GDP than they do in peer countries. This lower share of GDP determines the size of their trade surpluses. If Washington were to impose, for example, an effective 10 percent tariff on Chinese widgets, U.S. households would pay more for widgets. It turns out that this would affect the relative distribution of income in the United States. Assume that many U.S. households, perhaps all of them, would be directly or indirectly affected by the price of widgets; (if a given group of people didn’t directly buy widgets themselves, perhaps their local coffee shop would need widgets to serve them, in which case higher widget prices would be reflected in the price of their next cup of coffee). If the price of widgets were to rise, the real value of U.S. household income would decline—Americans would be able to buy fewer goods and services, in other words, for any given level of income. On the other hand, other sectors of the economy—domestic widget producers, for example—would see the real value of their income rise. In net terms, tariffs on widgets would effectively represent a transfer of wealth from ordinary U.S. households (consumers) to other sectors of the economy (mainly businesses and, through dividend payments, their usually wealthy owners). This transfer of wealth from a high-consuming sector of the economy to a low-consuming sector automatically forces up the savings rate, and, as discussed above, if savings rise relative to investment, a country’s trade surplus rises or its deficit declines. No, it does not, and that is why it is important to understand how tariffs (or depressed wages or a devalued currency) actually affect trade balances. When one assumes that they work by altering relative costs—by making imports more expensive relative to domestically produced goods—then it is pretty easy to understand why they are likely to be successful. A 10 percent tariff on imported widgets would cause the price of foreign widgets to rise relative to domestically produced widgets, causing Americans to import fewer widgets and reducing the U.S. trade deficit. In developing countries where desired investment levels are much higher than actual investment levels but constrained by high capital costs and the low availability of savings (most developing countries with the exception, mainly, of China), investment does rise. By transferring income from consumers to savers, these policies all result in higher investment, and the economy benefits from higher growth. Even though households suffer, their suffering is only temporary because the consequent increase in economic growth means that eventually they will earn more than they otherwise would have. This, in effect, is how trickle-down economics is supposed to work. The third option, by the way, is not available to the United States or to other economies with very deep, open, and liquid capital markets and strong legal and governance institutions (like the UK and other Anglo-Saxon economies). That is because these economies do not control their capital accounts, and for this reason they in effect operate like closed economies. Since the 1970s, when excess global savings first became a problem, roughly 40–50 percent of the world’s excess savings have been parked in the United States. As a result, the United States has always run a capital account surplus that it cannot control and a corresponding current account deficit. This means that U.S. investment must always exceed U.S. savings by the amount at any point in time of net capital inflows. One important, and perhaps surprising, implication is that the United States cannot engage in beggar-thy-neighbor policies because it cannot run a trade surplus. In fact, as long as its capital markets remain wholly open, it cannot even take steps to reduce its trade deficit except by making it harder, or less attractive, for investors to bring money into the United States. Because the U.S. trade deficit is set wholly by the net amount of excess foreign savings it has to absorb, it is not able to alter its overall savings rate. Aside from this blog I write a monthly newsletter that covers some of the same topics covered on this blog. Those who are interested in receiving the newsletter should write to me at chinfinpettis @ yahoo.com, stating affiliation. "In fact, as long as its capital markets remain wholly open, it cannot even take steps to reduce its trade deficit except by making it harder, or less attractive, for investors to bring money into the United States." A little question here. If in a situation where USA defaults on its debt obligations, aka back in the Obama face off with the tea party, will that make it harder for investors to bring money to United States? Moses Liao. I don't think it would make it any harder. But hey, if someone broke their word to you on money, You got less than you bargained for, only a fool would go back for more of the same. Right? I'm not a financier, but I don't think it works that way. Rather, I think that lenders simply perform a glorified NPV calculation. If it looks like the overall debt is low enough that payments can be made on it, presumably people will still lend. governments consume a small part of their income ... and save most of it.??? That got me too. I'm pretty sure governments save a small part and spend most of their income in addition to providing so called fiscal stabilizers such as the unemployment benefit. I found that quite odd too, but note that the concept of government savings isn't the same as the budget deficit. Government savings equals current spending minus current income, while the budget deficit also includes capital expenditure and capital transfers. From a national accounting perspective, a government can be a net saver while still running a budget deficit. The gov, as an entity itself, spend money on behalf of households. What the gov really consumes on behalf of itself is just a tiny portion of the total gov income (the expenses spent to keep the gov running as i understand). And whats not consumed is saved, or say invested. It is immediately tempting to consider government income as only what it raises in taxes. Clearly governments often spend more than their tax receipts. But that deficit is always covered by the sale of government bonds (Treasuries, Gilts etc). The money raised by these sales is also government income. The Budget Deficit that most governments run is the difference between the government's spending and income only from taxes and tariffs. That deficit never goes unfunded. The government also sells bonds e.g. Treasuries or Gilts. When considering what is the total of the government's income the receipts from the bond sales must be included. I think this is less about altering trade policy for the U.S. on aggregate. I think this is more about preparing us to ramp up strategic sectors during wartime. Think Aluminum. Think Steel. What uses these two composite metals? What's an easy way to restrict population growth? What's an easy way to raise wages? Do tariffs stop with China? What happens if strong dollar is neutralized during full-employment? This adds up. I could be wrong, but I think one of the primary implications of Michael's post is that the Fed can't tighten in any practical sense so long as other countries are able to continue place money in the US. Patel. I don't see things as you do. The fed is raising rates. Because of inflationary pressures. This increases the income of the wealthy. But the effect they want is that it squeezes out the financially weak and vulnerable, forcing businesses and individuals out of the economy, thus slowing the economy, bringing on a recession and an end to the inflationary pressures. question: if the U.S. will run a trade deficit no matter what due to the desire of foreign entities to hold U.S. dollar investments, is it not a free lunch for the U.S. to implement a border tax or some sort of across the board tarriff as a way to raise large amounts of tax revenue from foreigners and thus address the deficit in a relatively pain free way? Sorry Yuri, you display a lack of understanding of Mike's paper. Here it is: a tariff taxes the domestic household population, reducing their income. The foreigners don't pay the tariff, the importers do. Interventionist policies that make others more competitive cause trade diversion. Trade creation occurs of comparative advantages when there are open markets, and not asymetries in policies between national markets. It is not foreigners paying taxes or tariffs, it is importers. So, the tariff will impact make versus buy, on-shore or off-shore, or off-shore other domicile decisions. Not cause foreigners to pay a tax. Unless there is a foreign corporation, in a tariff-able product category, who does work in US, and imports the product to US. Or imports, in such a product category, to a wholesale, or distribution network, in US. Peter Scott. Yes. As an institution, the government is a big saver. Forget all the self serving lies put out there. What the government pays its' employees, which the employees then go out and spend as households. Well, that's the households. Right? When the government spends on say, a polio vaccine, that's an investment in my eyes. That's savings. Right? Cause in a closed economy Savings = Investment. The same holds true for all government supported research. The same is true for public education, roads, bridges, water and sewage treatment plants. I'm a little less satisfied with the military as savings, but hey how about all the defense related scientific research. Basic scientific research. You know, the kind that somehow leads to valuable things far afield. All the conservative attacks on government. Well most of them. I take them as pointed to the undermining of the democratic process. The wealthy and the powerful want the public to turn away from expecting and employing the government for the betterment of the community at large. They don't want the general population to use the government to promote the general welfare. Hence the attacks on social security, medicare, medicaid, snap, chip, uc, public education. They distrust a sense of community in the general population. This all seems so logical and also seems to be an accurate reflection of reality. To me this means it should be possible to build a computational -graphical model. Steve Keen has done something like this that explores the effects of private debt vs public debt ratios on GDP growth. But it is, if not too complex, not at all compelling. What seems to be needed is perhaps an open source effort to construct a model based on agreed principles and a limited number of variables and "states" that can model passed events and has a predictive capacity. This should be a lot easier than weather and climate change. And perhaps more valuable. It needs to be recognized that the world is a closed system and has profound vulnerabilities. If we are headed for a global beggar thy neighbor scenario the formation of this situation should be plotted and the means of escape demonstrated in a compelling way. Simon. Sorry. We'v been in a beggar scenario for quite a while now. You appear a little naive to me. Thinking that the leadership is sincerely looking for an understanding to improve the welfare of their country and citizens. Here's the truth: WHEN THE TRUTH RUNS AGAINST THE INTERESTS OF THE WEALTHY AND THE POWERFUL THE WEALTHY AND THE POWERFUL STEP ON THE TRUTH. The corruption economics. How about it. The Mystro. The top economist in the whole country. The largest and most destructive financial and economic event in 79 years. And he didn't see it coming and in fact contributed to it. And when we have telescopes that can see billions of light years out into space. How else do you understand that? It seems to be true that the Oligarchy is a pretty stable political structure trending up while democracy is trending down(I think the US may be an Oligarchy). But that does not remove any interest in economic understanding. Even Oligarchs need to understand what's going on. The US isn't even close to default and hasn't been close to default since the US Civil War. The issue for the World right now is that the World needs US trade more than US needs World trade. A sometimes painful renegotiation of almost every trade item is ongoing and will likely continue till the next World economic boom cycle gets into high gear. ouch. (wink) Unless you consider 9% or greater $USD inflation default. At this time it looks like every $USD ($FRN) every created is trying to make its way back to the US. If this continues then every $USD denominated loan will have to be converted to local currency or be written-off. The Euro may be forced to be the reserve currency of the world. (joke) I predict Germany will leave the Euro if the Euro becomes the World reserve currency. "making treasuries more attractive": Treasuries are entries in a data base of the US Treasury Department. Any country holding US Treasuries can be cut off by the US Congress at any time. (smile) That is why gold is so popular at this time. Assume no workable policies can be reached to close open, very deep, and liquid capital markets of US, what if the following fiscal polices are implemented: 1) Border adjustment tax, peg to trade-deficit/total-trade ratio. It may causes currency devaluation and/or wage repression. But we don't want wage repression. So 2) Wage tax credit (obviously non-refundable), peg to 100% + trade-deficit/total-trade ratio. But we still have huge capital inflow from excess saving nations. So 3) Monetary asset sale tax, such as M&A, stock trading (exempt first 1m annually), second home, etc (bond is not a sale), paid by buyers (as in normal sale tax), progressive up to 300%. Hope it can steer extra saving from foreign nations toward the productive investment, instead of speculative investment. Will these fiscal polices somehow balance the trade and capital better than current policies? One course of action would be to tax Chinese currency manipulation rather than Chinese exports. In order to undervalue the renminbi against the dollar, China drives the dollar's value up by buying dollar-denominated financial assets, principally U.S. Treasury bills and bonds. To discourage China from doing so, the U.S. government should tax the income on Chinese holdings of U.S. financial assets. For example, the U.S. Treasury would withhold tax on interest paid on Treasury bonds held by China. For every $10 billion of Treasury bond interest paid to the People's Bank of China (the central bank), the U.S. Treasury could withhold 30 percent, or $3 billion, in tax. By taxing the precise actions that cause distorted exchange rates, the United States would increase the incentive for China and other currency manipulators to allow the values of their currencies to reflect market fundamentals. An important benefit of this approach is that it would explode the myth, commonly held in China, that the United States wants or needs China to buy U.S. Treasury bonds. If China were to stop manipulating its currency, the dollar would decline against the renminbi, boosting U.S. exports and economic growth. If other currency manipulators -- such as Singapore and Taiwan -- do not absorb the implied lesson, their bilateral tax treaties with the United States could also be canceled and the amendment applied to them as well. Thanks to years of experience at combating money laundering and terrorist financing, which involves far smaller sums than the trillions of dollars that China has invested in U.S. financial assets, the U.S. Treasury Department should have no problem tracking and identifying any attempts at evasion. Even though this paper primarily dealt China and US, to US its problem is not just trade deficit with China. So far, US has deficit $25b from China, $10b from Germany, $5b from Japan, $5b from South Korea, and $5b from others, monthly average. Michael mentioned many times the wage repression of Germany. So only valid approach is across board BAT. VCR, I do not think that it is quite as simple as simply taxing Chinese currency manipulation rather than Chinese exports." If China were to revalue the RMB upwards but also expands credit and lowers interest rates, the wealth transferred from households to the tradeable goods sector would exceed the wealth transferred to the household sector via revaluation. This is in essence what Japan did after the 1985 Plaza Accords. Thank you for this post. I remember reading your very similar arguments in The Great Rebalancing (Chapter 2? ), but this argument seems so much clearer now. It does (as always) leave me with some questions, though: (1) Am I correct that the implication is that the US and UK are cursed, not blessed, by being home to the largest capital markets? Shouldn't the average American or Brit want Wall Street/the City to dry up and go over to, say, Germany or Singapore? (2) (And this one really confuses me...) Given your analysis, why are you in favour of saving the EU instead of its dissolution? It seems like Greece, Spain, Italy, etc would be better off by its abolition. Obviously you've already thought this through--I just can't connect the dots. Claire. Hi. #1. The way I see it. There's nothing wrong with large, open capital markets - they'r good things. It's just that they get abused. Stop the abuse. Stop the abusers. I'm not Mike, but I think he's right. They should put in place capital controls, limiting the movement of currency into this country, or preferably taxing it. #2. I always understood Mike to be in favor of the European Union, the community of Europe, and also believing that the Euro, the EMU was ill-conceived and doomed to failure from the beginning. Claire. Let me add this to @2. Mikes' thinking was the EMU was ill-conceived in not necessarily the idea of it, but how it was being implemented and administered. Hi Yok! Thanks for the reply. Re: #1: I believe that capital controls would stop (or at least significantly slow down) the movement of currency into the US and GBR. In that case, wouldn't that in turn reduce the ability for the US and GBR to be the world's preeminent financial centers? (More to the point, wouldn't this be a good thing?) I ask this question largely because I never thought of it before--I always just assumed that there was an advantage to having Wall Street and the City. I'm now beginning to think that this advantage really only exists when a country needs to attract capital, and neither country has a scarcity of capital at the moment--rather, they have a scarcity of production caused by too much capital. Is this the correct interpretation? Yok--Re#2: the EU--I guess that whether it was initially poorly implemented or not, it is difficult to see the creditor countries just accepting the previous EU without the Euro (actually, it's difficult to see the European creditor countries accepting anything other than the status quo, which is untenable). German policies may have been reckless, but German politicians aren't going to do anything that hastens their own banks to seize up and their own unemployment rates to shoot up significantly. Hi Claire. Your questions get progressively more difficult. I'm not Mike, but I think "Yes, you'r right, capital controls, tax on incoming capital would reduce the activity on wall street." You'r right, we don't need more capital. The more freedom they have the more speculative they become. With greater wealth concentration and capital currency available and weak demand and lack of good investment opportunity, the lust for wealth and power gets the best of them and they gamble. I think the financial sector is very bloated and wasteful. The way I see it - they're long overdue for a trimming. Would of answered sooner but Mike didn't get your stuff from the 20th out till Aug 1. To qutoe Voltaire "common sense is not so common". Best post ever professor. Really should be required reading for policy makers everywhere. "for the U.S. to implement a border tax or some sort of across the board tarriff as a way to raise large amounts of tax revenue from foreigners and thus address the deficit in a relatively pain free way? ": That is what President Trump is threatening. Other countries think that solution is painful. The import sector of the US economy doesn't like it either. Tariffs were the way the US Government was mainly financed before the year 1913. Ian S. "Capital Controls are the quickest way to derail an economy. " Yes, you made the point that if you try to keep domestic money in, it runs. But that's a straw dog. How about addressing Mike's point: BARRIERS TO KEEP FOREIGN MONEY OUT. Yok. My first reply was to Claires question about the advisability of having capital controls. Now to your question about barriers to keep foreign money out - please read the last paragraph of Michael's article. It cannot be done in the US or UK. Apart from the impossibility, why would that be desirable? In the UK the majority of manufacturing industry and several service business are majority owned by foreign corporations. But British capital thus released from domestic assets has taken a minority share in nearly every successful company in the world. 'Balance of payments' here cannot be defined or even encompassed because the boundary of what is the UK economy certainly isn't our territorial waters. Ian S. I read the last paragraph in Mike's article. I suggest to you that you re-read it; you'r not understanding him correctly. "In fact, as long as it's capital markets remain wholly open, it cannot even take steps to reduce its trade deficit except by making it harder, or less attractive, for investors to bring money into the United States." I understand him to be saying being "wholly open" is a vulnerability. Hey, we don't even do soft controls by using red tape, fees, time, taxes, say like the Chinese do. Of course we do have some tariffs and controls, but speaking in a general sense. Mike has made this point several times before, and we have used capital controls before. You are making false associations - holding in is the exact opposite of holding out. Right? So we might expect opposite reactions from the public. Right? Also too, implied within your post is the idea foreign money coming in is a blessing - wrong. Unless the foreign money is accompanied by new technology or managerial expertise, the net effect is harm to the country. You imply that a developed, rich country is solely dependent on private investment for growth - wrong. You say a socialist government is bad - that's another false association. All governments, to the extent that they promote the welfare of the general public are socialist. A republican, what they call a democratic government, is in fact, of a socialist nature. Socialism - to place under the control, responsibility, authority, or ownership of the public, where the public can be considered to exert, or have meaningful control. The so-called western democracies were in fact more socialist than the Soviet Union. Only one small typo: In paragraph titled: Doesn’t that mean that tariffs... at the end of fourth line the phrase "than it is" shuld read "then it is"
@Giancarlo thanks for catching that! We have corrected it. Peter Scott. Yes. Governments save like crazy. Think of the government and households as institutions. Are you saying there is no realization in the US administration that, to effectively close the US trade deficit, the monetary side of international trade needs to be addressed, ie. the international status of the USD as international reserve currency needs to be revoked to be replaced with a supranational unit of account which is not also the domestic currency of a participating country? I would find this hard to believe. Well, the US administration is not a single individual, and in any case it has competing objectives. The US benefits politically internationally by having the reserve currency (or at least it believes it does). The question is whether the drag on the domestic economy is worth the political benefits they receive internationally. Immediately after WWII, the overwhelming consensus was that the price was worth paying; now the overwhelming consensus may reverse. "Will these fiscal polices somehow balance the trade and capital better than current policies?" : Doubtful even one of these intriguing ideas could be implemented at this time. Might have been possible ten years ago. Current US policies are making $USD unpopular as a reserve currency. With backing from IMF and BIS a cryptocurrency could replace a reserve currency for trade. UN Security Council would have to sign-off also. Not likely to happen either. Re: Current US policies are making $USD unpopular as a reserve currency-->I think you might be missing the point that there is no viable alternative to the USD as a reserve currency because no other country is willing to accept such a status due to the economic implications. Other countries do not buy $USD because they lover or hate the US--they buy it in order to beggar their neighbours. The IMF comment is a little strange. Firstly, the US has a veto. Secondly, why would any country other than the US want to end the USD status as a reserve currency? "Remember that imposing tariffs, devaluing a currency, and forcing down wages all have the same impact: all these methods transfer income from ordinary households..." What would happen if the U.S. government distributed all its tariff income directly to ordinary American households? Could be done very simply, the way the Alaskan Permanent Fund distributes money to Alaskan residents. Firstly, I'm having trouble understanding the causality and relationship between government spending and current account deficits. Specifically, what percentage of U.S. government trade deficit is determined by a.) fiscal deficits and b.) mercantilist export promotion policies of China, Japan, Korea, and Germany. If (Imports - Exports) = (Investment - Savings) + (Government Spending - Tax Revenue), it is easy to see how mercantilist policies in foreign countries force savings up and affect the trade account of trading partners. However, it isn't intuitive to me how this relationship works for the US's fiscal deficits and causality in the function. I would appreciate help thinking about this or reference to further reading. Secondly, excellent post Michael. I thoroughly enjoyed the reading. Thank you for the insight this blog brings. Disregard my question. I found Michael's post from 2017 on the topic.
" IMF comment is a little strange": Sorry for being unclear. My reasoning is that SDR is expected to be reserve currency at some unspecified future date. Could be in this century if US tariffs are raised high enough. Current US administration would probably be ok with world replacing $USD with SDR. IMF has a gold reserve for some unknown reason (at least to me). To back SDR if some members are recalcitrant? To cover non-performing-loans? "paying attention to Prof. Pettis's arguments":Page 29 of "The Great Rebalancing" : "...If the tariffs caused Fredonian real household income to decline...". That is the question. (I think) World leaders don't think US imposed tariffs will cause household incomes in the US to decline. If household incomes in the US did decline then the idea of distributing US imposed tariff income to US households might be accepted. "distributed all its tariff income directly to ordinary American households? ": Would make tariffs very popular with the average voter collecting a payment. Importers do not want a tariff. Works like a sales tax to them. Hugs - But more to the point, would it not be a perfect way to strengthen the U.S. economy? If the basic problem with the world economy is insufficient spending power in the hands of consumers, then redistributing money to U.S. consumers (the poor and middle class, the rich don't spend much) should help the world economy. Using tariffs to raise the money to redistribute to consumers has the potential to keep the jobs benefit in the U.S. instead of letting it go to China and elsewhere. Right? "the basic problem with the world economy": Current belief in leadership is that the world has too much monetary capital. The current economic disputes are over market share and who gets to deploy monetary capital. In the US the poor have issues that have nothing to do with an economy. In a poor country the US poor would be forced to change their behavior. Randy Quaid the actor is an example. Hugs, with all due respect I'm not sure whether you have been paying attention to Prof. Pettis's arguments or whether you simply disagree with them. His arguments have nothing to do with whether the poor (or anyone else for that matter) are morally deficient. He simply believes that anything that redistributes buying power to entities that will USE it (to buy goods and services, not to hoard or invest it) is good for the world economy as it is today. Anything that does the opposite is bad for the economy. Not forever and for always, but now, given the way the economy is today. Yok. Your definition of Socialism stating 'taking under the control of the Public' is what it might say in the manifesto. In fact it is taking it into the control of the State. Socialist governments do everything in their power to stop the Public having a say in the running of the enterprise, or removing them as the managers. This is based on Envy - see Helmut Schoek and the Fatal Conceit see Hayek. Cuba, Zimbabwe, Venezuela, QED. There isn't any difference in the effect of imposing a block on money coming in, or imposing it on money leaving. The fact is that money is prevented from circulating by either block and it soon departs for better places. Karen, I'm just saying that leaders don't think that US consumption needs to increase and that leaders don't think US consumption will fall because of tariffs by a significant amount. That is why US tariffs are viewed so negatively by the world. Ian S. Your head is filled with a lot of Dogma. The people who lust for wealth and power - they hate democracy. They don't like republicanism. They always look for a facade. Socialism - it's about loving your country, your community, your neighbors. It's the soil out of which comes patriots. Your examples of socialism failure - false associations. I don't know that Zimbabwe even considered itself socialist. How about these examples of socialism: Denmark, Sweden, Norway. Socialism, it's about people looking to their own well being and welfare through the institution of government. Representative government is an example of socialism. Social Security - socialism. US Army - Socialism. Medicare - socialism. Public Schools - socialism. The police - socialism. Public Water and Sewage - socialism. Your heads full of nonsense. The wealthy and the powerful - they don't want their hands tied. They want complete freedom to use their wealth and power to their advantage. The greed and selfishness of the wealthy and the powerful is a burden to the general welfare. It' how we get wars of aggression and subjugation. But hey, to your way of thinking, the wealthy and the powerful are blessing to humanity wherever they go. We better kiss their &*$ or they'll pick up their marbles and go somewhere else.